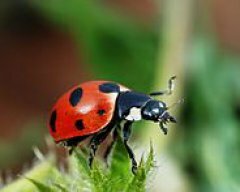 Attracting Beneficial Insects into your Garden. Pests and diseases of shrubs and trees. Attracting beneficial garden insects to your garden should be one of your main aims as a gardener. 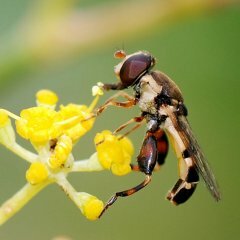 Plant pollen and nectar plants to attract beneficial insects. Once the adults are attracted to a garden they are likely to stay and lay their eggs there. The small flowers of dill, parsley,catnip, lemon balm, thyme, and other herbs provide food for tiny parasites that might drown in the nectar of larger flowers. Some attractive flowering plants that provide a source of either nectar, pollen or both include daisies, alyssum and marigolds. Bird baths or shallow containers can provide a source of water for insects. Change the water in the containers every 2-3 days to discourage mosquitoes from breeding in standing water. Sticks or pebbles placed in the water serve as perches for insects so they won't drown. Don't use chemicals. Pesticides can harm or kill beneficial insects as well as the pests. 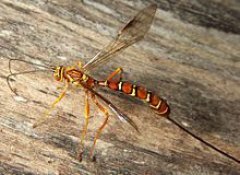 Ichneumon flies: They have slender bodies, and the females have unusually long, curved ovipositors (egg-laying instruments) that can pierce several inches of wood. The eggs are laid in the eggs, larvae, or pupae of other insects, usually butterflies or moths. Spiders: Garden spiders vary in colour from pale yellowy-brown to very dark brown, but they all have a characteristic white cross-shaped group of spots on their abdomen. They are widespread and common throughout the UK, except in some areas of northern Scotland. 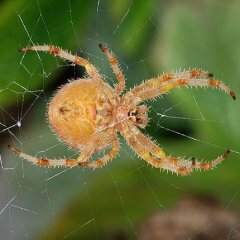 Spiders eat flying insects such as butterflies, wasps and flies. 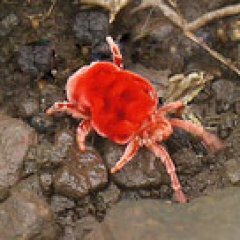 Velvet mites: They are bright red and covered in tiny hairs, which gives them a velvet appearance. Only 4mm long, it is nevertheless our largest and most conspicuous species Mites are arachnids, like spiders, and therefore have 8 legs. It is mite is predatory on any creature smaller than itself including other mites, springtails, false scorpions and even the silken fungus beetle. 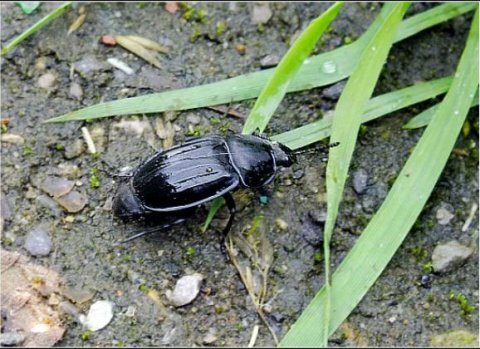 GROUND BEETLES: Black garden beetles feed on eel-worms, cutworms and leather-jackets and other larvae and insect eggs. You can encourage them into your flower garden by keeping the ground covered, so that they have leaf cover to hide under during the day. At night they will come out to feed on the pests. Use the closely planted deep bed system in the vegetable garden to keep the ground covered and grow a green-manure plant between crops. Centipedes are fast-moving predators of many small insects and slugs. They are light brown with longer legs than millipedes. Like the black beetle, centipedes need ground cover to hide under during the day. At night they will emerge in search of prey, even climbing the plants to reach it. It is the larvae of these creatures, which resemble "thin wasps", that are very useful in the natural control of aphids. The adult flies lay their eggs directly in the aphid colonies and the hatched Young are voracious feeders. Hover-flies can be attracted into the garden by planting certain species of flowers such as marigolds (Tagetes and Calendula) and nasturtiums (Tropaeolum sp.). 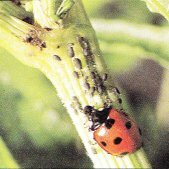 Again, it is the larvae who have an insatiable appetite for aphids. 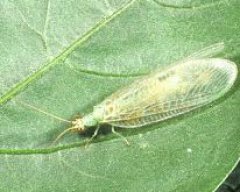 Adult lacewings lay their eggs on the undersides of leaves. Although they do not feed on flowers they can be encouraged into the garden by varied planting. Both the easily identifiable adult ladybird and its less-familiar, slate grey larvae eat vast quantities of aphids. They cannot be attracted by specific plants but will be encouraged into the garden by cultivating a varied selection of plants. The following plants attract insects with nectar and pollen. They also provide shelter for beneficial insects. The more diverse your plantings the more diverse will be the insects you will attract. By choosing plants that are in season at different times of the year you will supply a continuous supply of food. Ground-cover plants, green manures and mulches will provide a habitat for beetles. Borage: Borage is a source of nectar for bees and other insects. Pot marigold: Hardy annual that produces bright orange, daisy-like flowers from May to the first frosts of autumn. Californian poppy (Eschscholtzia): Fast-growing perennial. Flowers from June until September. Coriander: Annual herb, grown for the seeds. Sow from spring to early summer.